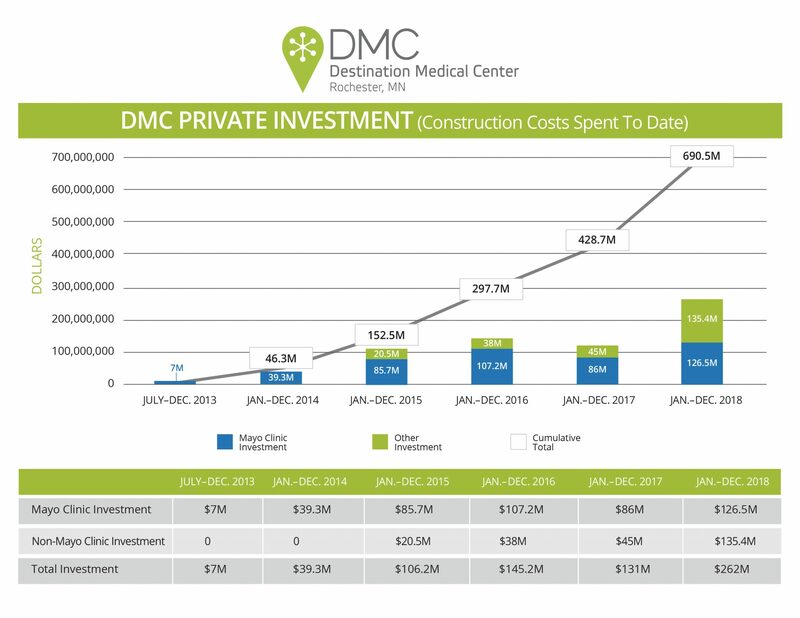 (Rochester, MINN) March 21, 2019 – The Destination Medical Center Corporation (DMCC) today announced that private investment in the Destination Medical Center (DMC) district totaled $262 million in 2018, a 100 percent increase over 2017. The 2018 private investment will release approximately $13.5 million in state public infrastructure funding. Since 2013, DMC has generated more than $690 million in private investment for development in Rochester. To release state funding over the span of the initiative, DMCC must present the Minnesota Department of Employment and Economic Development (DEED) with an annual accounting of qualified private investments in the DMC district. DEED is then responsible for certifying the investments and qualifying DMC to receive state funding for public infrastructure projects. Nine project grand openings are scheduled in the DMC district in 2019. 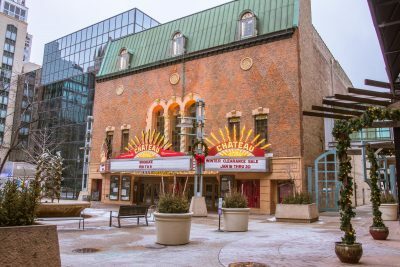 Feb 16, 2019 – ROCHESTER, MINN – The City of Rochester is pleased to announce that five proposals were received in response to the Request for Proposals (RFP) for the initial operations and management of the historic Chateau Theatre. The submissions included: Entourage Events Group, Exhibits Development Group, Arcades are Awesome!, Threshold Arts LLC, and Arts Trust Minnesota. Of the five proposals, three were from local entities and two were from entities who reside in the Twin Cities area. Staff from the City of Rochester and Destination Medical Center Economic Development Agency (DMC EDA) are currently reviewing the submissions and will be bringing forward a review process in the coming weeks. Community engagement will be a part of a to-be-defined selection process. The Destination Medical Center Corporation Board of Directors and the Rochester City Council approved $1.1 million in funding for the renovation. The escalator and second floor are expected to be removed in the coming weeks. All initial work being done to the building is anticipated to be complete in mid-June 2019. Feb 13, 2019 – ROCHESTER, MINN – The City of Rochester and the Destination Medical Center Economic Development Agency are excited to launch the Rochester Energy Benchmarking Program for businesses and building owners to track their energy use and identify ways to save money on utility bills. The kick-off meeting will be held at the Rochester Public Library (101 2nd St SE, Rochester, MN 55904) in Meeting Room C on Tuesday, February 19, 2019 from 3:00 – 4:00 p.m.
Attendees will learn about the benefits of the program, hear from organizations that are currently realizing the benefits of benchmarking, and how to participate in this voluntary program. Building owners and facility managers are encouraged to attend. Representatives from participating organizations will be in attendance. There will be networking and light refreshments following the program. On April 24, 2019, the Benchmarking program will host a training session for interested organizations at Rochester City Hall in Room 104 from 8:00 am. – 12:00 p.m. This session will help organizations create and efficiently complete a benchmarking profile which is the core of participation in the program. A digital version of this release can be found here. (Rochester, MN) Feb. 5, 2019 – The Destination Medical Center Corporation (DMCC) Board of Directors today approved a resolution supporting two preliminary mobility hub locations in Rochester, MN, and authorizing up to $400,000 in financial support for additional studies and engineering. In addition to the significant progress with the DMC transportation plan, nine private development projects, totaling more than $300 million, have planned openings in the DMC district in 2019. They include: Hilton hotel, First Avenue parking ramp, One Discovery Square, Urban on First apartments, Residence at Discovery Square apartments, Hotel Indigo (Holiday Inn renovation), Wells Fargo renovation, Chateau Theatre short-term use renovation and the Ronald McDonald House expansion. In his new role as Mayo Clinic President and CEO, Dr. Gianrico Farrugia (jan-REE-koh fa-ROO-jah), a 30-year veteran with Mayo Clinic, met with DMCC Board members and provided a few remarks. Destination Medical Center (DMC) is the largest public-private economic initiative in Minnesota’s history. The 20-year plan to transform Rochester into a global destination for health and wellness will attract developers, investors, startups, and entrepreneurs to live, work and play in America’s City for Health. For more information, visit dmc.mn. 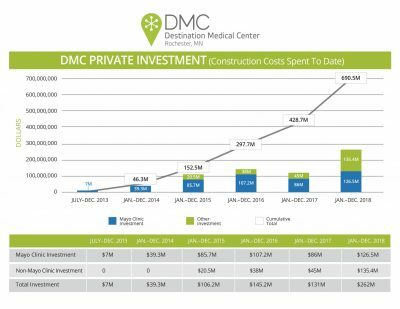 (Rochester, Minnesota) Sept. 25, 2018 – The Destination Medical Center Corporation (DMCC) Board of Directors today recognized significant progress with several DMC projects. Among them – One Discovery Square – a Mortenson development consisting of 90,000 square feet of lab and office space that will cater to the life science economy. Mortenson Director of Real Estate Development Jeremy Jacobs updated the Board on progress, and when asked about any new leases, he noted that Epic has signed on as a new tenant, joining previously announced anchor tenants Mayo Clinic and the University of Minnesota Rochester. Additional companies (large and small) will be announced within 60 – 90 days. One Discovery Square is expected to open in April 2019. The Destination Medical Center Corporation (DMCC) Board of Directors has approved public infrastructure funding of four new downtown Rochester development projects. The DMC funding of $11.82 million supports $342 million in new investment, that includes waterfront development, Heart of the City redevelopment, and new hotel concepts. The projects will result in the creation of more than 450 new, permanent jobs and nearly 600 construction jobs. Rochester, Minn. (March 22, 2018) – The impact of Destination Medical Center (DMC) is being felt throughout the southeast Minnesota region, and DMC Corporation (DMCC) board members recognized considerable progress toward several private developments and previewed some proposed projects that continue to showcase Rochester as a prime market for investors, developers and entrepreneurs. Action by the Board included authorization of a 2017 private investment report to the Minnesota Department of Employment and Economic Development (DEED) totaling more than $131 million. To release state DMC funding over the span of the initiative, DMCC must present DEED with an annual accounting of qualified private investments made within the DMC district. DEED is then responsible for certifying the investments and qualifying DMC to receive state funding for public infrastructure projects. FOR IMMEDIATE RELEASE – Rochester, Minn. (Nov. 2, 2017) – The Destination Medical Center Corporation (DMCC) Board of Directors today recognized significant progress toward several private developments, public infrastructure, business development, and planning goals of the Destination Medical Center initiative. A significant highlight shared with the Board focused on job growth. More than 3,300 jobs were added since 2014 and construction activity at the four DMC-funded projects will result in more than 1,000 combined construction jobs. The Board specifically acknowledged today’s groundbreaking by Mortenson on their Phase 1 building at Discovery Square. ROCHESTER, Minn. (June 14, 2017) – The Destination Medical Center Corporation (DMCC) Board of Directors held a Transportation Work Session today to provide an update on findings since the DMC Transportation Workshop in April.